Glowy, metallic red shimmer. Very dense and pigmented. 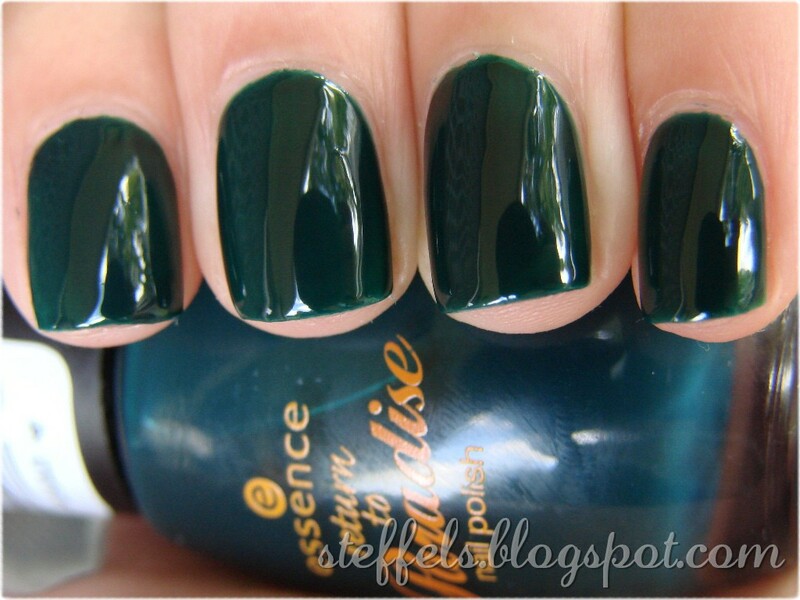 It's opaque in one coat but I used two for depth. And because I've been unable to resist glitter lately. I slapped on a coat of Lippmann RRS. The black base in RRS looks lovely over red. 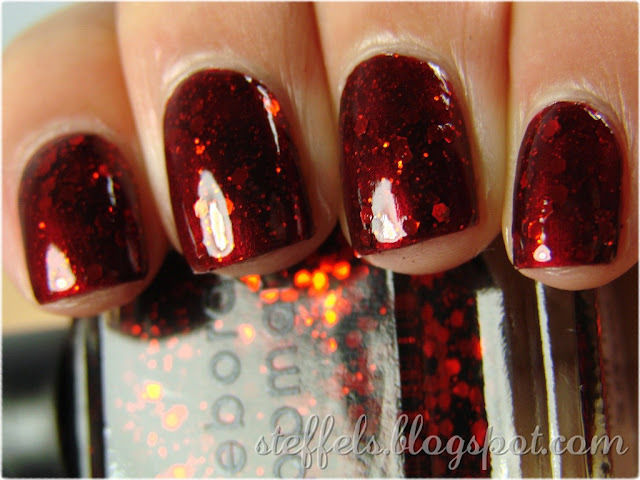 The whole look is very deep and vampy. 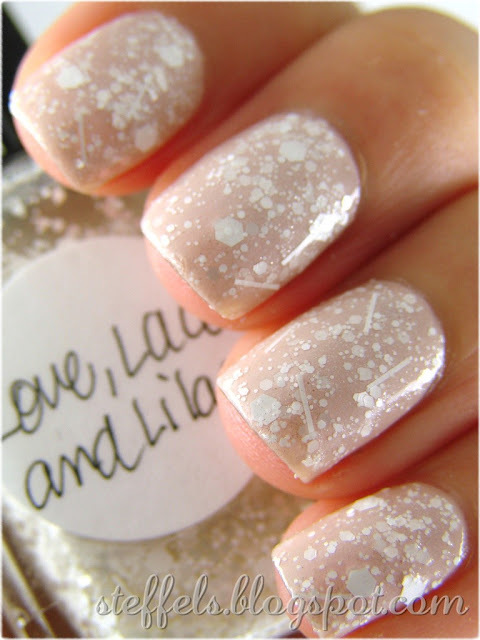 I did a mani like this I think for Christmas back in 09. 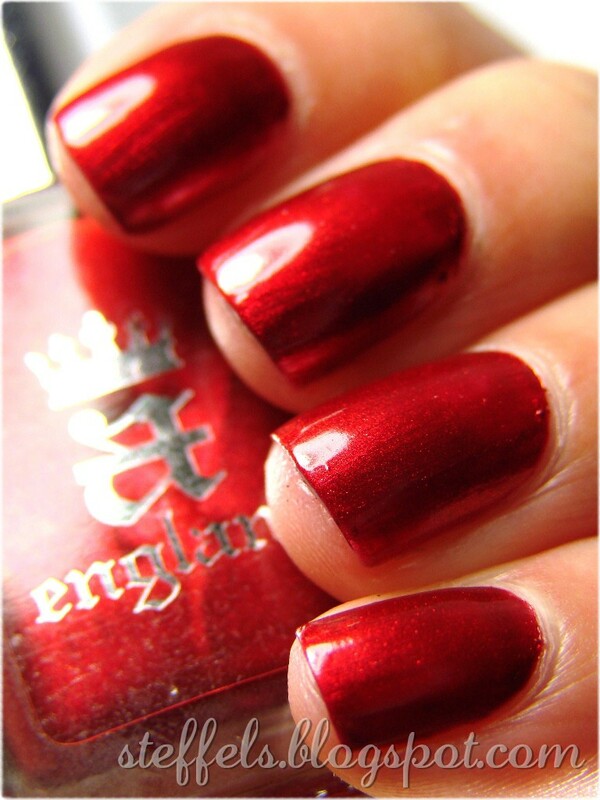 Perceval is available directly through A-England's website. And um, three words: Free. International. Shipping. Somehow, I lost my original pics with Boy-Girl Party so I decided to put it back on today. This is one coat of Boy-Girl Party sandwiched between Ulta3 Blossom Fever as a base and Rimmel French Rose on top. I have fairy floss nails! So pretty! I think I'm beginning to appreciate pinks more and more. I've worn many pinks this month and I can't get enough of really girly looking manis. Can you see the sizeable dent in Nebula? No points for guessing which one is my favourite out of the three! Nebula. Three coats. 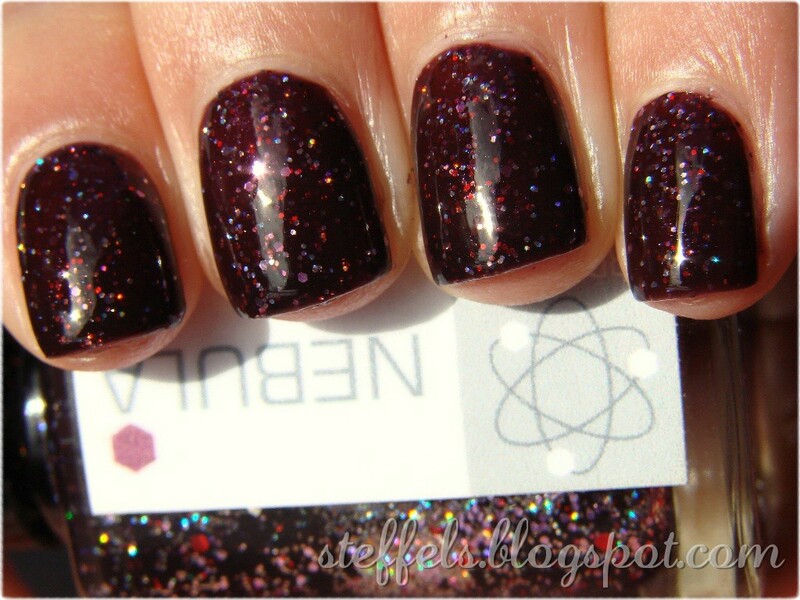 Red, pink and holographic silver glitters in a dark reddish-maroon jelly. Such a rich colour and also the most jelly out of the trio. The bases of the other two are very creme-y looking compared to Nebula. Event Horizon. Two coats. 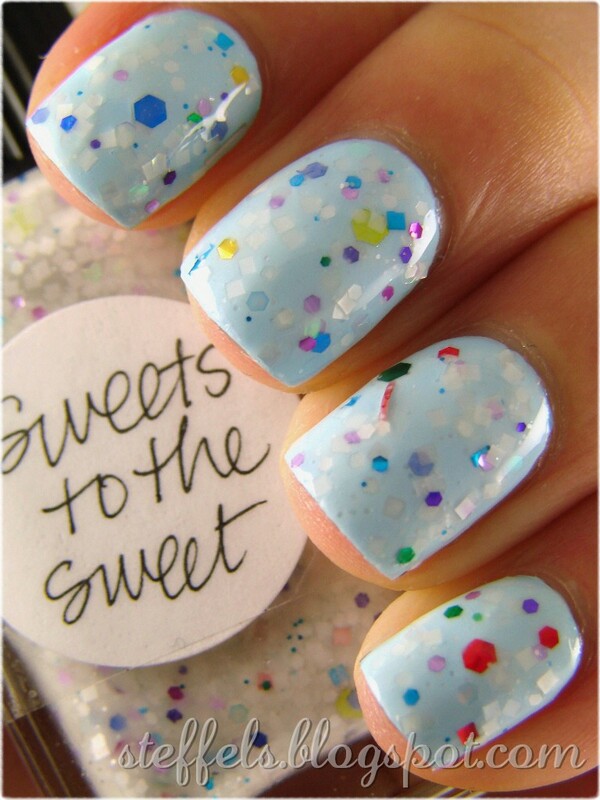 Blue, turquoise and holographic silver glitters in a dusty teal base. 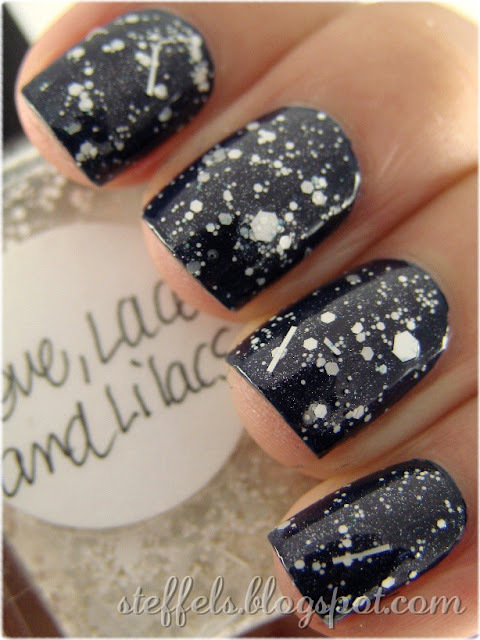 I know this is supposed to be a collection inspired by space, but Event Horizon totally reminds me of the deep sea. Quasar. Two coats. 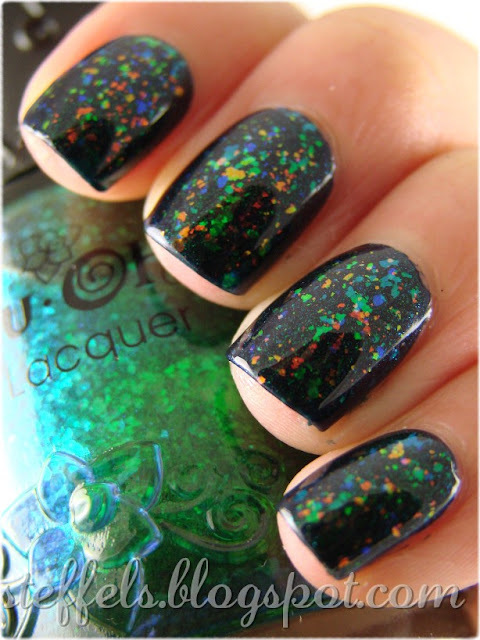 Several shades of green and holographic silver glitter in a blackened green base. I thought this would be similar to Tony Moly Neptune but it's definitely different. Quasar is darker and murkier. Such a lovely trio. 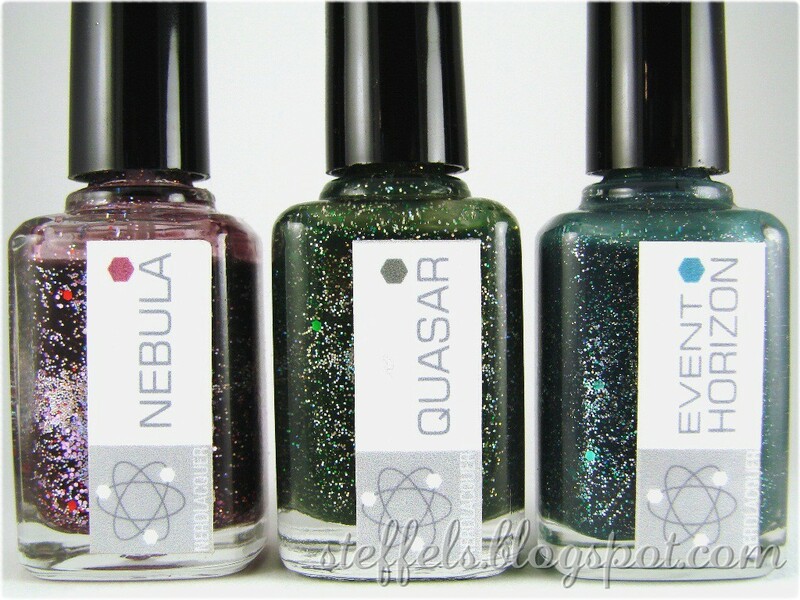 Makes me want more NerdLacquers! 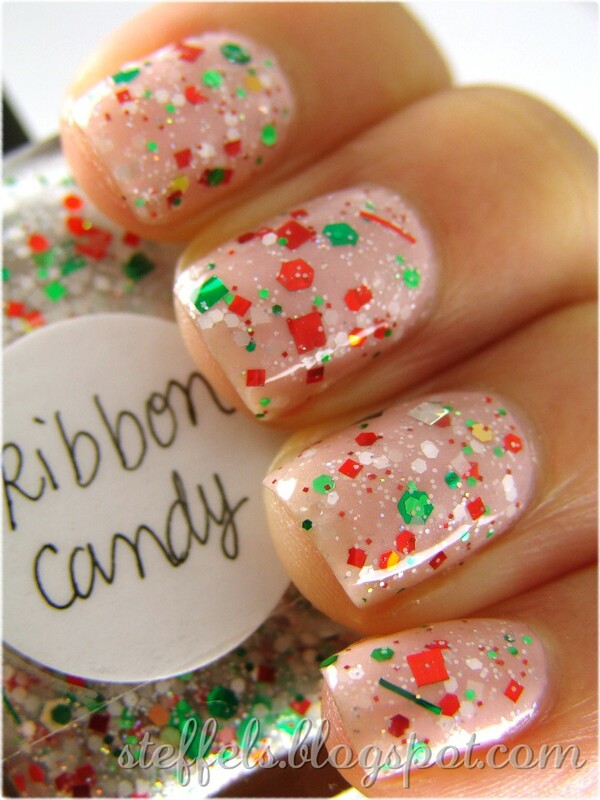 Ribbon Candy. Two coats over Essence Wear Your Little Tutu. Ribbon Candy is kind of like the Christmas edition of Sweets to the Sweet - same idea except.... Christmassy. I received this as a gift last year and I wasn't going to post it but I recently received a request. So this one is for you Jessie! I have horrible issues with posting in a timely manner. I've worn all my Lynns now but I have trouble sitting down and actually writing up the blog posts.... so to pick up some slack and move things along, here are a few of my Lynn manis. Not much blabber though because I have a raging headache that I've been trying to unsuccessfully smother in Panadol. One coat of Forget You Not over white. 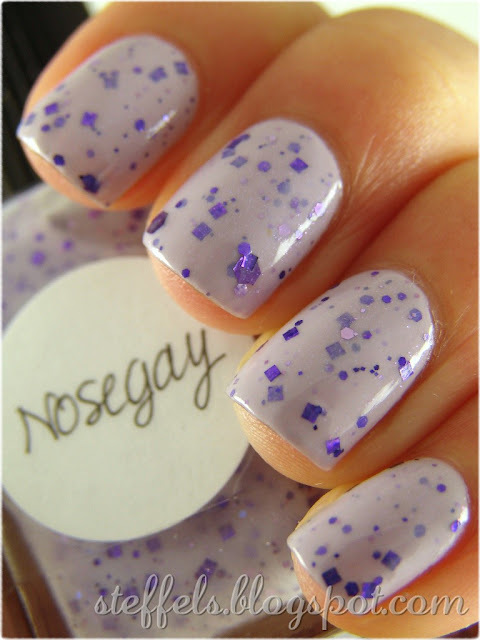 I wanted something different as a base to show off the pretty periwinkle glitter. I think white was a little too stark though, maybe I should have tried a soft pink. One coat of LL&L. I didn't realise Passport Blue was so dark until I put it on. It was practically black in dimmer lighting. Two coats of Nosegay over Missha VL001. The secret shimmer in this is so very nice in the sun. One of my unexpected favourites! I'm now craving more colours like this--glitter in milky bases. So lovely. Essence Back to Paradise. Deep blue-toned green jelly. Not so keen on the formula but the colour is amazing. 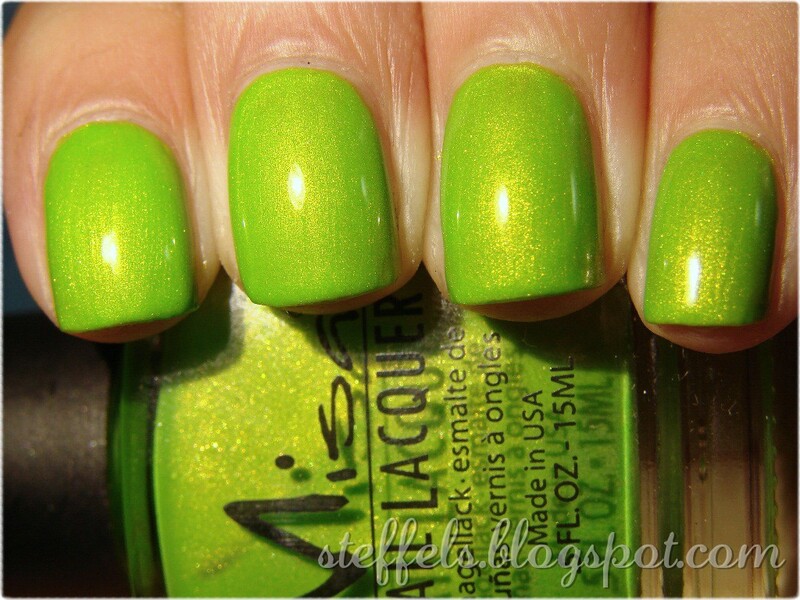 One coat of Big Universo Espectral over Nfu-Oh 56 over China Glaze Gussied Up Green. MAC Dry Martini. 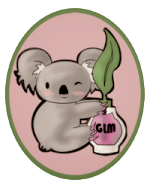 Gross colour? Yes. Do I still love it? Also yes. 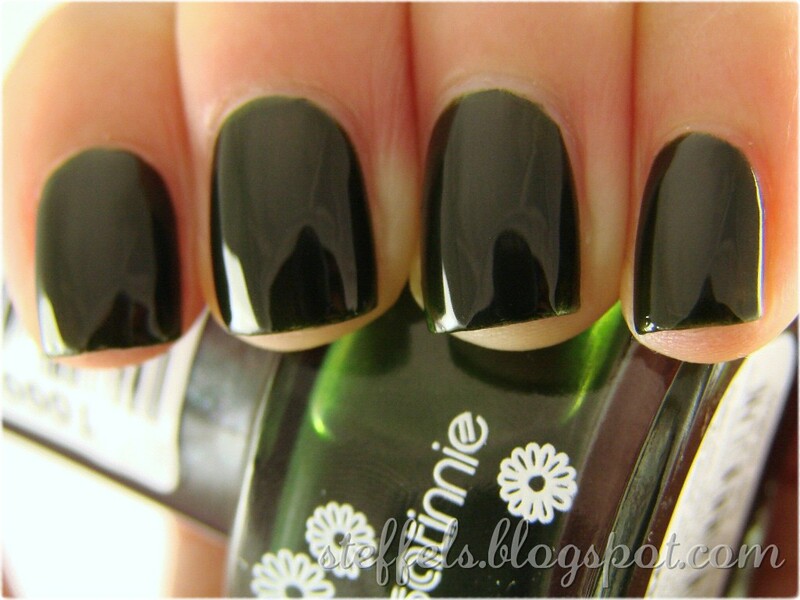 Ozotic 503 over black. The colour shift is subtle compared to the other Ozotics but it's still very pretty. 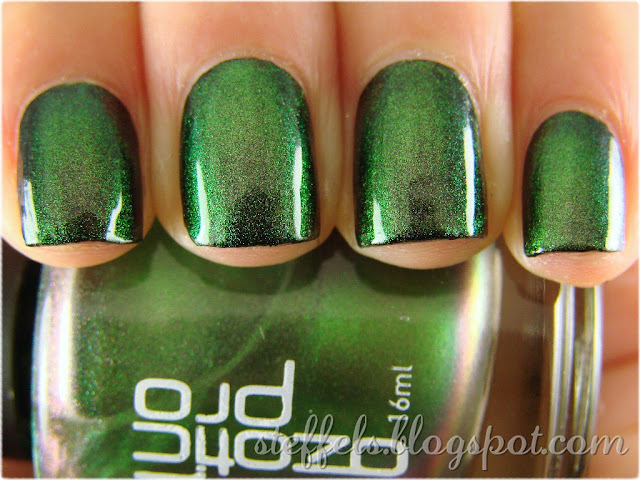 OPI Simply Smash-ing! Gives me the worst lobster hands in the world but I still love it. Unnamed Sasatinnie. 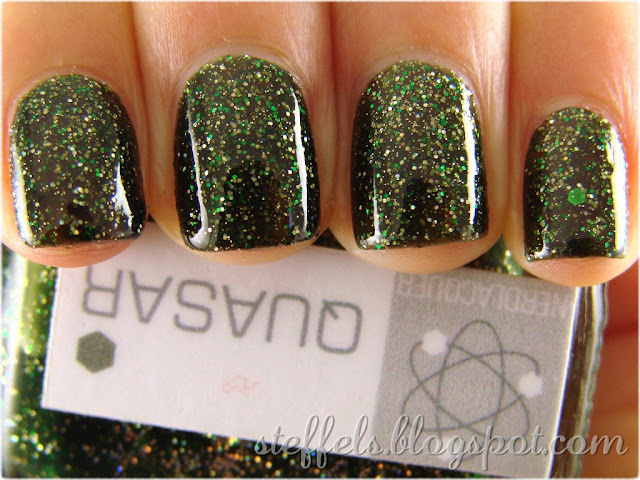 Very dark smoky green jelly with some hidden shimmer. Reminds me of Here Today, Aragon Tomorrow. Jelly sandwich with New York Summer Amaranth and Love my Nails Pink Surprise. 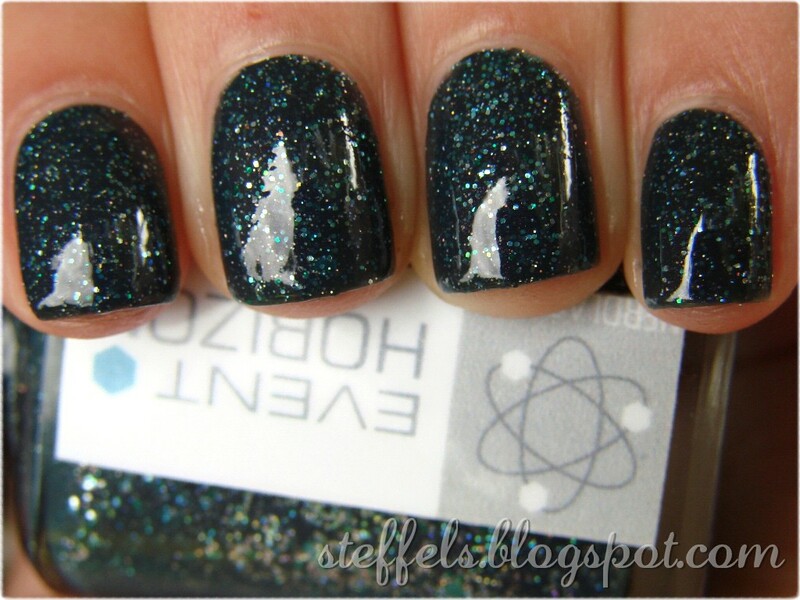 Diamond glitter! OPI Jade is the New Black. A perfect dusty green. 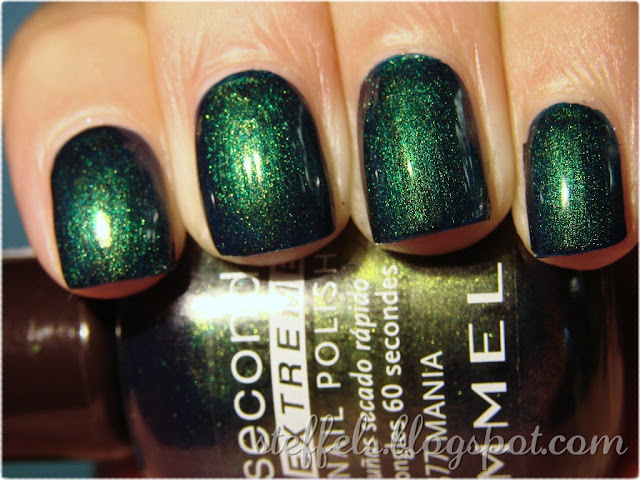 One of my most worn green cremes. 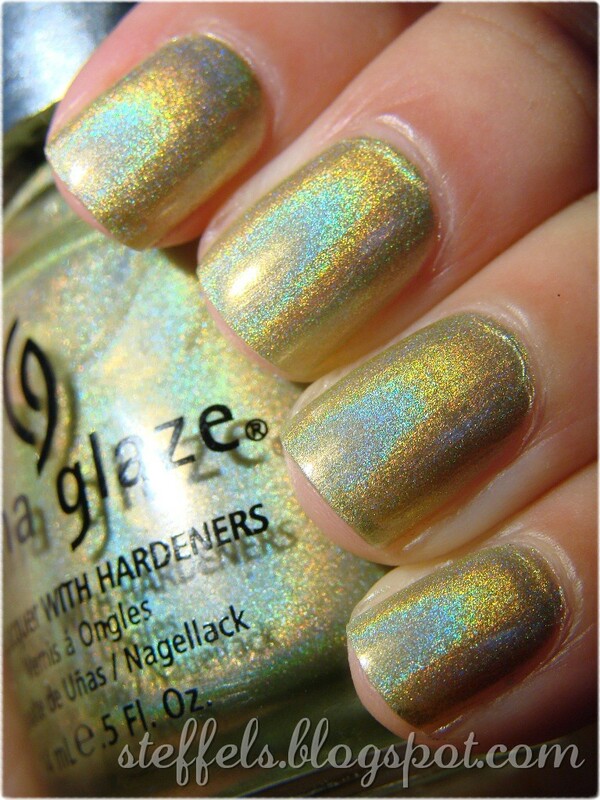 China Glaze L8R G8R. 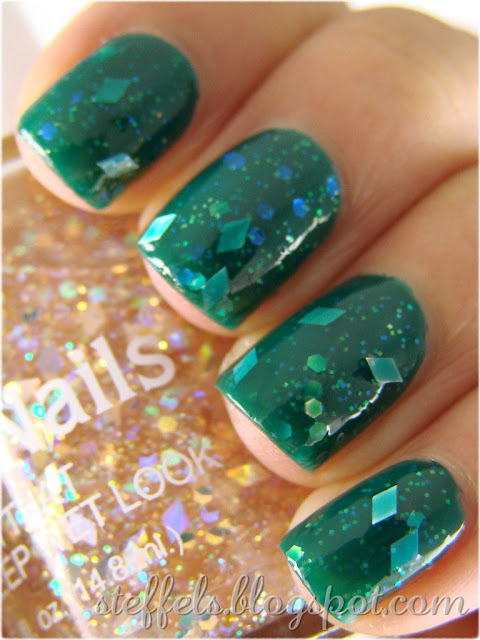 Pale green holo. I haven't pulled this baby out in years! Glad I did! 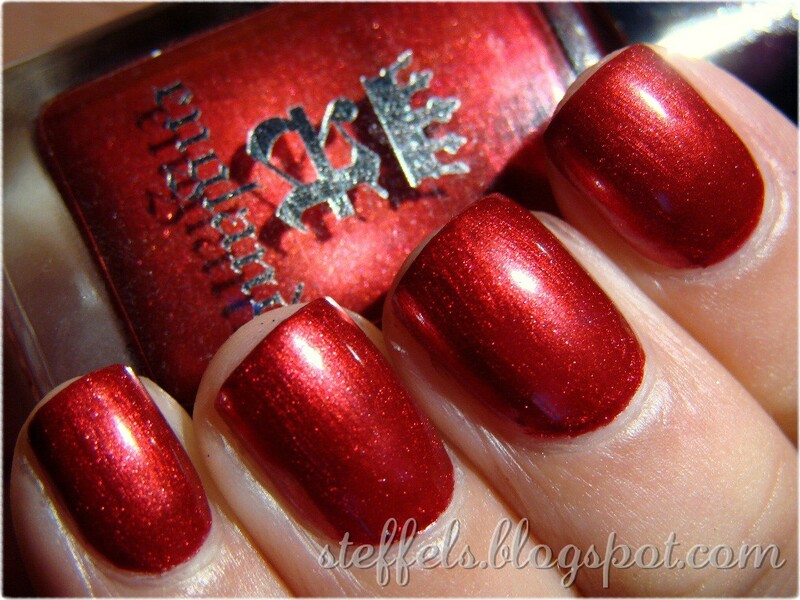 And lastly, Rimmel Mania. My love. I know this isn't technically green but that's besides the point :) My bud Kristy snapped this up for me on eBay. (((((hugs!)))))) Isn't she wonderful?! Mania is a close cousin of Bloom Bianca. But better. So much better! Hope everyone's St Paddy's Day was awesome, green and full of good luck!